Labels can be printed from a purchase order, sales order or from the inventory list. 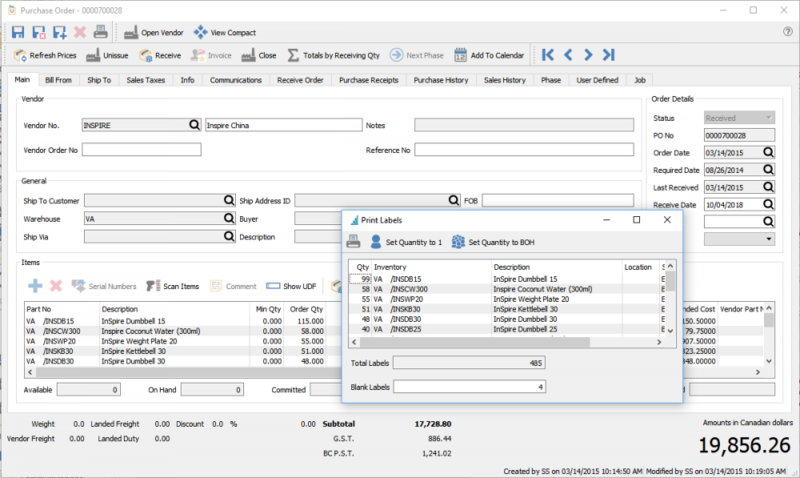 Click on the label button on the details toolbar of the purchase order and a screen will come up that is populated with the items on the purchase order. The quantities will be set to the receive quantity of if they have not yet been received, the order quantity. 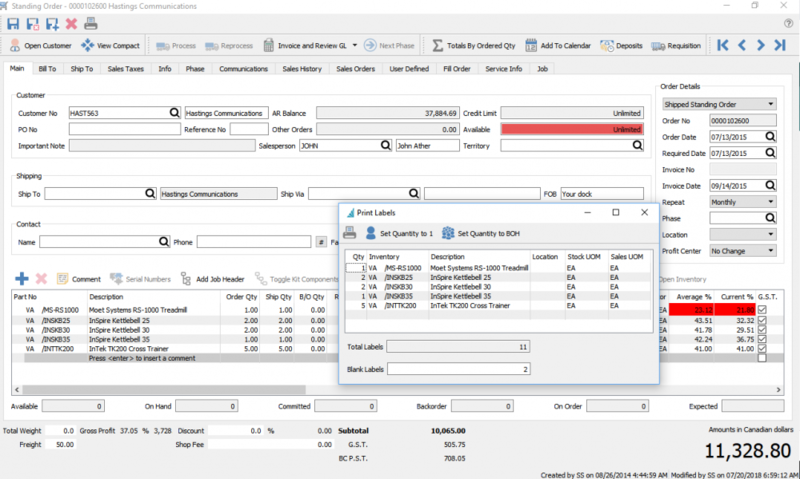 Click on the label button on the details toolbar of the sales order and a screen will come up that is populated with the items on the sales order. The quantities will be set to the ship/commit quantity. To print labels from the inventory list, highlight the ones required and click on the ‘Labels’‘ button on the inventory toolbar. Print – Prints quantities of each item on the list. Set Quantity to 1 – Clicking this sets all quantities to 1 so only 1 label will be printed for each item. Set Quantity to BOH – Changes the quantity of labels for each item to the balance on-hand. Qty – Gets populated with the receive or order quantity from a purchase order and the On-Hand quantity if printed from inventory list. These quantities can be manually edited. Part – The item for which labels will be printed. Description – The description of the item for which labels will be printed. Total Labels – Total quantity of labels that will be printed. This is helpful so that the user loads enough labels in the printer. Blank Labels – How many blank labels to print before starting the first one. This is helpful if the user is printing on sheets of labels and some were used the last time labels were printed.